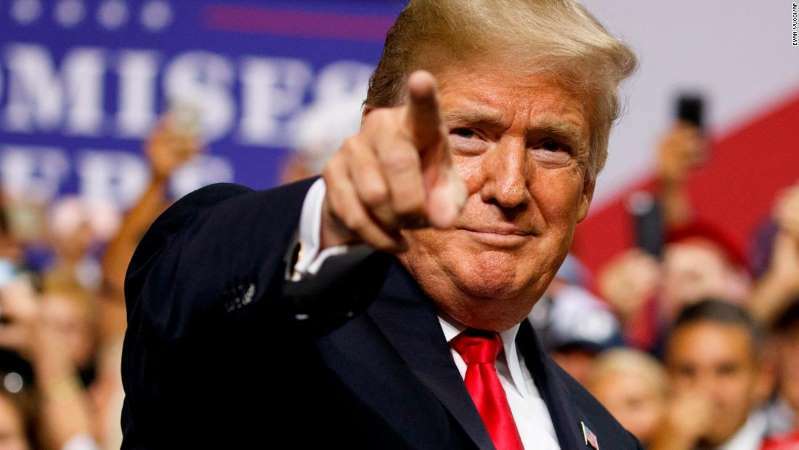 Here's an amazing stat: In the last 14 contested Republican primaries where President Donald Trump has endorsed a candidate, his pick has won -- or is leading -- all 14 times. That's remarkable. (Hat tip to WaPo's James Hohmann for doing the math!) And it speaks to the fact that despite Trump's weak numbers among the general populace, he remains a massively powerful force within the GOP -- someone who can make and break candidacies with a single tweet. Take Tuesday night. Trump endorsed John James in Michigan's Republican Senate primary, Bill Schuette in the Michigan governor's race and Kris Kobach in the Kansas gubernatorial primary. James, who had been considered an underdog prior to the Trump endorsement, won the right to face Democratic Sen. Debbie Stabenow. Schuette, the sitting attorney general, crushed the state's lieutenant governor and several other challengers for the right to take on Democratic former state Senate Majority Leader Gretchen Whitmer in the fall. [post_ads]But Trump's biggest coup appears to be his endorsement of Kobach, the controversial secretary of state who currently holds a lead of fewer than 200 votes over appointed Gov. Jeff Colyer. (The race has not yet been called by CNN.) Kobach, who led Trump's short-lived commission to investigate electoral fraud, is a favorite of the state's Trump conservatives but viewed very, very suspiciously by the party's establishment. His victory, if it holds, would make the Kansas governor's race competitive. Trump, never one to avoid the tooting of his own horn, tweeted this out on Wednesday morning: "5 for 5!" Presumably, that's a reference to Trump's endorsement record on Tuesday -- counting Troy Balderson's apparent win in the Ohio congressional special election and Missouri Attorney General Josh Hawley's easy win in the state's Senate primary race alongside Kobach, Schuette and James. "As long as I campaign and/or support Senate and House candidates (within reason), they will win! I LOVE the people, & they certainly seem to like the job I'm doing. If I find the time, in between China, Iran, the Economy and much more, which I must, we will have a giant Red Wave!" That's not exactly the right conclusion, based on Trump's results. More accurately, the first line of that tweet would read: "As long as I campaign and/or support Senate and House candidates (within reason), they will win primaries." This should not be surprising -- as poll after poll has shown that Trump is among the most popular Republican presidents ever among Republicans. The latest Gallup weekly tracking poll showed that 89% of Republicans approved of the job he is doing. And that's in a poll in which Trump's overall approval among the broader electorate is just 41%!